﻿ Cosmos Marine Surveyors & Consultants Co., Ltd.
1987~1988 Fritz Transportation Int’l Taiwan Ltd.
Taipei Sales Representative of Shipping Dept. Chief Officer, 2nd Officer and 3rd Officer, Apprentice, Chief Officer for 3 years, 2nd Officer for 2 years and 3rd Officer for 2 years. Served on general cargo ships, bulk carrier and car carrier. P&I condition surveys on general cargo, bulk carriers. Pre-purchase inspections of general cargo, bulk carriers. Expert opinion for collisions and loss of vessels for Underwriters and Maritime Law Firms. Republic of China, Chief (first) Mate license. Republic of China marine surveyor’s license. 2001~2004 Senior marine surveyor and manager of the Ta Feng Marine Surveyors & Consultants Co., Ltd.
1994~2001 ITS as Manager of Marine Division. 1987~1994 NKKK (Taiwan) Ltd, as Manager & Senior marine cargo surveyor. 1981~1987 Served on board ocean going vessels as Master Mariner of Tankers & Bulk carrier. 1972~1981 Served on board ocean going vessels as a deck officer of bulk carrier, tanker, general cargo ship, molten sulphur tanker, etc. 1971~1972 Steel cargo surveys for P&I Clubs and Shippers, load and discharge. (BHP/British Steel)Military service in Navy as an ensign. P&I condition surveys on general cargo, bulk carriers and tanker. Pre-purchase inspections of general cargo, bulk carriers and tanker. Education 1971 Navigational Department of National Ocean University. Completed on Inert Gas Systems & Crude Oil Washing Course conducted by the Master Mariners Association in 1980 & by the Leith Nautical College Edinburgh in 1981. Seafarer’s Training Course including maritime regulations, oil tankerman, prevention of sea pollution, etc. in 1983. R.O.C. Master’s certificate class “A”. In 2001 granted on Approved Nautical Inspector ID card No.27 issued by The Bahamas Maritime Authority. Chief Officer, 2nd Officer and 3rd Officer, Apprentice, Chief Officer for 1 years, 2nd Officer for 2 years and 3rd Officer for 2 years. Served on container vessel. Investigations in to cargo damage for P&I Clubs, Underwriters. 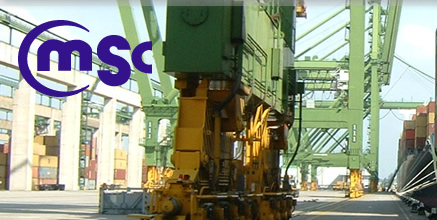 Steel cargo surveys for P & I Clubs and Shippers, load and discharge (BHP/British Steel). Republic of R.O.C. Marine surveyor’s license. Date of Birth January, 1973. 1988~2003 Surveyor & Principal Surveyor/China Corporation Register of Shipping. GL Class non-exclusively surveyor & KR Class non-exclusively surveyor. 1975~1988 Yangming Marine Transportation Corp.
3/Engineer x 1.5 year (Oil tanker). 2/Engineer x 2 years (Oil tanker & General cargo ship). 1st/Engineer x 2 years (Oil tanker & Container ship). C/Engineer x 5 years (Bulk carrier & Container ship). New ship building supervisor of Yang Ming Line in CSBC Kaohsiung shipyard. (“P” Type Container ship) x 2 years. Navigational Department of National Ocean University. And majored in Marine Engineering. National Sun Yat-Sen University, Material Science Graduated Institute, researched/majored in Material Quality/Test Technical. Quality Management system Assessment, Jeff Monk Training Auditor/lead Auditor Course No.A8498 registered by the International Register of Certificated Auditor. Cert. of Lead Auditor for Quality Management system assessment. Cert. of Lead Auditor for ISM-Code. Survival at sea No.2100537 R.O.C. Marine Diesel Propulsion system Training Simulation No.1200022 R.O.C. 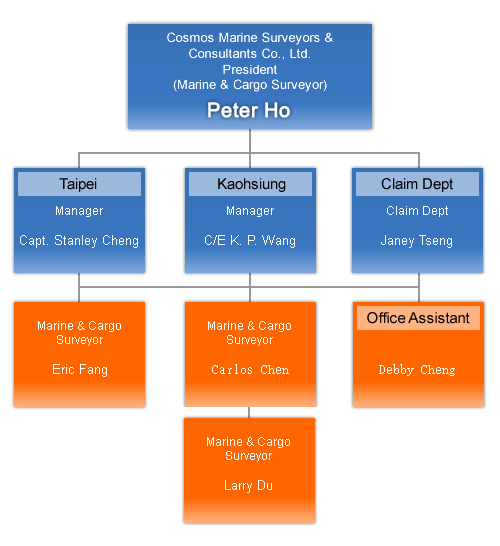 Handling of the marine and cargo claims for the Survey Division of Jardine Matheson Co., Ltd. Assist to handle all claims from Lloyd’s of London, and a plethora of Underwriters from all areas of the globe. 2nd Officer and 3rd Officer, Apprentice, Chief Officer for 1 years, 2nd Officer for 2 years and 3rd Officer for 2 years. Served on container and bulk vessel. Date of Birth December, 1978.